Nicky and I love holidays/events with which specific cocktails are associated. Christmas always means eggnog. St. Patrick’s Day is Guinness. You have to have champagne with New Year’s Eve. Cinco de Mayo is Margaritas. Tuesdays always mean Manhattans. Well, you get the idea. 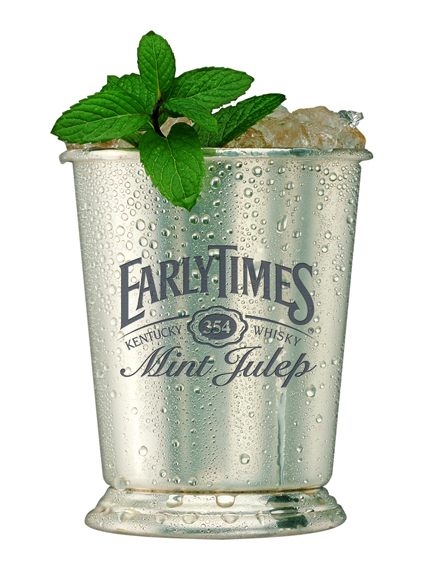 So tomorrow for Derby Day we celebrate the julep. The mint julep to be traditional and precise. Sipping a mint julep. What a gentile and wonderful way to enjoy a sport. Especially a sport that provides two of the most exciting minutes each year, then is over and allows you to go back to your cocktail! Yes, we love the Derby. It seems that Senator Henry Clay of Kentucky introduced the mint julep to Washington DC at the Round Robin Bar in the early 1800s. 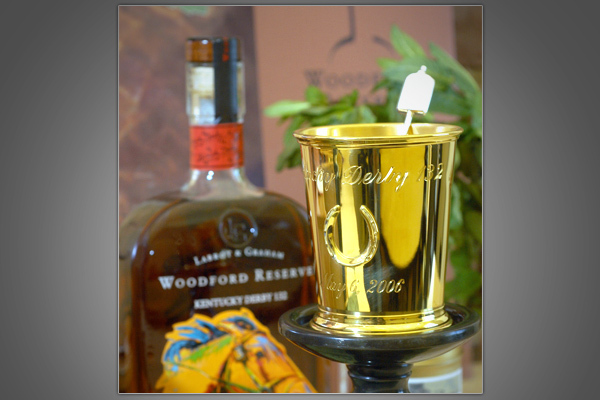 Popularity of the drink grew and in 1938 it became associated with the Kentucky Derby and promoted by Churchill Downs. In 1987, Brown-Forman established a contract agreement with Churchill Downs naming the “Early Times Mint Julep” as the “official drink” of the Kentucky Derby. Now, close to 120,000 juleps are served at Churchill Downs over the two-day Kentucky Oaks and Derby event. While there are many variations on the mint julep, we will go straight to the horses mouth on this one, and provide you with the recipe of the official Early Times Kentucky Derby Mint Julep. In the bottom of an 8 oz glass, muddle (crush, bruise, slightly offend) a few mint leaves. Fill the glass with crushed ice. Add one tablespoon of simple syrup and one tablespoon of water. Then add two ounces of Early Times. Stir gently until glass frosts. Garnish with fresh mint and enjoy. Traditionally the julep was served in a silver or pewter mug or cup which allowed the drink to frost the mug and the imbiber to hold the handle. Now you will find the drink served in a highball, old fashion, or Collins glass. There is a strong Georgia tie this year with a hometown horse as a contender in the run for the roses. Mucho Macho Man, a three-year-old colt owned by Dean and Patti Reeves of Suwanee, is currently at a 12 to 1 shot Saturday. Post time for the race is 6:24 p.m., but most of the celebrations are kicking off at 5:00 p.m. around town. South City Kitchen Vinings – Put on your seersucker suits and biggest Derby hats and enjoy heavy hors d’oeuvres and a cocktail tasting on the patio. Sip on a perfect mint julep, mojito or a festive Kentuckyrita. The talented bartenders will be on hand to teach you how to make these luscious libations and will send you home with complete step-by-step instruction and recipes cards. The kitchen will be serving up traditional Derby favorites such as grilled pimento cheese sandwiches, Kentucky Burgoo (stew), and Goetta (Kentucky sausage meatballs). Win or lose, if you stay for dinner you will get 10% off your meal. Tickets to the Derby party are only $25 and are available online. Prohibition – Prohibition will host a Customer Appreciation and Kentucky Derby Party at 5:00 p.m. And let me interject here that they truly know how to mix up a fabulous julep! Usually there is an entire garden of mint springing up from the glass. Amazing! 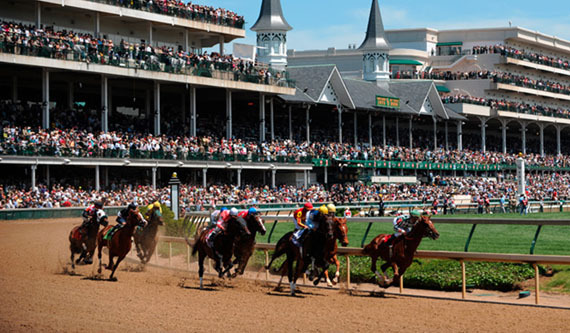 The race will be shown on the big screen and a ladies hat contest will take place at 7:00 p.m.
DBA Barbecue – The Derby festivities begin at 5:00 p.m. with $4 mint juleps. Show up in your best Derby hat and seersucker suits to get 10% off! 29th Annual Derby Day 2011 – A tradition since 1983, this social event attracts more than a thousand folks each year and benefits the Shepherd Center’s Therapeutic Recreation Program. It is held at the Georgia International Horse Park in Conyers and will broadcast the race on two big screens. Enjoy food, beverages, live and silent auctions and live music. Tickets are $60 in advance and $70 at the gate. Chopstix – The Derby Day party gets underway at Chopstix at 4:00 with a free buffet from 4:00 to 5:00 p.m. Women are encouraged to dress in their Derby best and compete in the Derby Hat Competition to see who is sporting the best finishing touch!